This is a great accompaniment to almost every recipe in this book because it offers a sweet counterpart to most of the spicy and tangy flavors found in other recipes. And because the ingredients needed are found in most pantries, the batter can be whipped up in a moment’s time and left to bake unattended. Preheat the oven to 350 degrees. 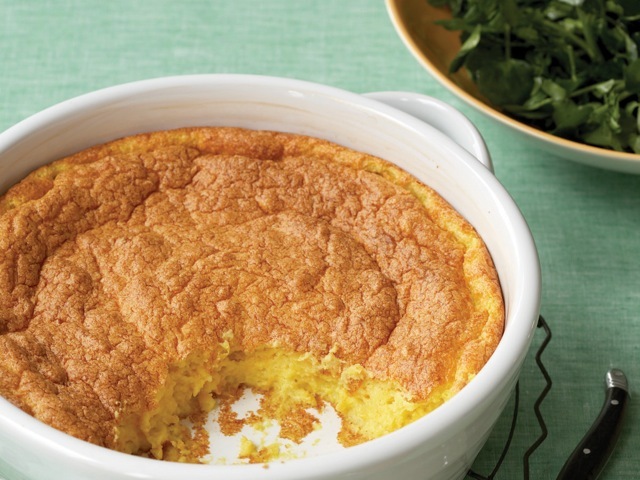 Grease a 9-inch square or round baking dish with butter. Set aside. Combine the corn and the milk in a food processor and purée until the corn is well blended. The result will be a mixture with a rough consistency. Put the egg yolks in a large mixing bowl and, using a rubber spatula, mix until well blended. Add the puréed corn mixture, melted butter, cornstarch, baking powder, and salt. Mix well. Put the egg whites in a bowl. Using an electric hand mixer, beat until stiff peaks form. Using the same rubber spatula, stir one-quarter of the beaten egg whites into the corn mixture. Carefully fold in the remaining egg whites. Pour the corn mixture into the prepared baking dish and bake for 1 hour. The tart is ready when a skewer inserted in its center comes out clean and the top is golden brown. Because the texture of the tart is similar to that of a soufflé, the best way to serve it is to scoop it out of the pan with a large spoon. This dish is best eaten soon after it has come out of the oven. However, you can serve it at room temperature after it has sat for an hour or so. Frozen corn works just as well as fresh corn and is preferable during the winter when corn is not in season. If you are using frozen corn, measure the amount needed before defrosting. A food processor is the best equipment to use for this. You can put all the ingredients in at once and let it purée. A blender can also work; however, you may have to purée the corn in batches and scrape down the mixture with a rubber spatula. While this recipe calls for a 9-inch square or round baking dish, you can go the extra mile and make individual tarts in 6-ounce ramekins. Reduce the baking time to 30 minutes. The individual tarts are ready when a skewer inserted into the centers comes out clean.